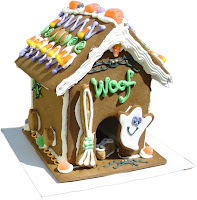 We're feeling really honored and lucky that The Pet Elite magazine has added our Gingerbread Doghouse to their New Products listing. 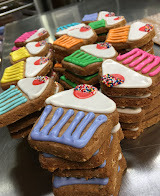 We're just now gearing up for our gingerbread house production, so the timing is perfect. Ray is "the architect" and Mary is "the decorator" while head honcho Penny makes sure we're not slacking off. A million thanks from us to Pet Age magazine for featuring our awesome bake-at-home biscuit kits and to the fab new blog/stylish pet info resource Little Bark Book for mentioning Ma Snax. You are our heroes! Sunday morning at the Berkeley East Bay Humane Society Bay To barkers . Big fun for dogs and their people. The day started with a mass dog walk, a parade around the event and out around the bay. We returned to play in a dozen games to test our dog skills, agility and obedience stuff, with a ribbon prize for 7 of 11 tasks. Penny shared her dog cake and tasty treats with some new friends and old pals. All in all a great day , it seemed to end too soon.